We created StudentList view in the view section, which display all the student information as shown below. To create a partial view, right click on Shared folder -> select Add -> click on View.. If partial view will be shared with multiple views then create it in Shared folder otherwise you can create the partial view in the same folder where it is going to be used. In the Add View dialogue, enter View name. Select scaffolding template List because we are going to create view to display multiple students' information. Select Student model class and also check "Create as a partial view" checkbox and click Add. This will create _StudentList.cshtml as shown below. We have removed following action link in auto generated code as we don't want to display "Create New" link in every view. 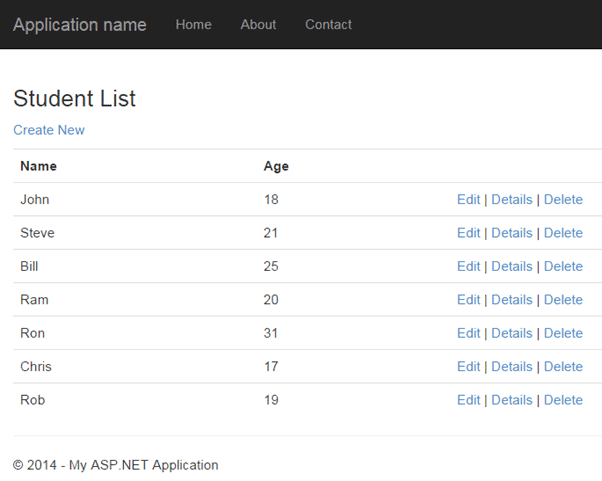 Now, we can render _StudentList partial view by using Html.Partial(), Html.RenderPartial or Html.RenderAction method. 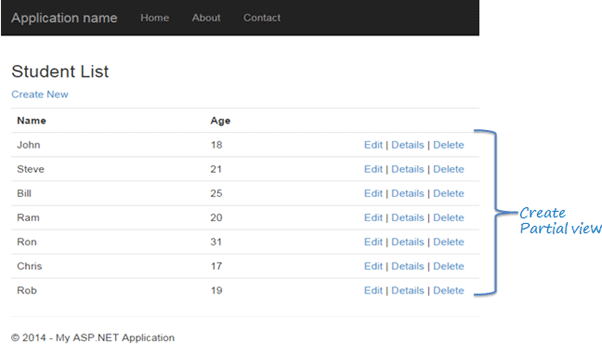 Let's use this _StudentList partial view in Index view. Index action method in Studentcontroller passes IList<student> as shown below. The following Index.cshtml view renders _StudentList partial view using Html.Partial() method. As you can see in the above code, First parameter of Partial method specifies partial view name and second parameter is model object. The following Index.cshtml view render _StudentList partial view using Html.RenderPartial() method. RenderAction method invokes the specified child action method and renders the result in the parent view. 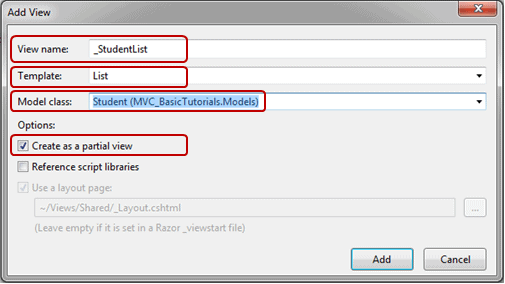 To render partial view using RenderAction method, you need to create action method in StudentController class. So create StudentList action method as shown below. StudentList action method is marked with ChildActionOnly attribute, so that it will be invoke as child action from view, not directly from the URL. Also, notice that StudentList action method injects IList so we don't need to inject model in Index method. The following Index.cshtml uses RenderAction method to render _StudentList partial view. Thus, you can render partial view by multiple ways.